With the completion of Chevron’s new base oil plant in August 2014 at the Pascagoula (Miss.) refinery, the company consolidated its position as the world’s leading producer of premium base oils, the main component used to manufacture high performance lubricants. The new Pascagoula base oil plant (PBOP) joined Chevron’s existing facilities in Richmond, California, and a joint venture partner plant in Yeosu, South Korea, bringing Chevron’s worldwide total to nearly 60,000 barrels per day. When refined, premium base oil is clear, like water. The premium base oil market is expected to grow from 30 percent of the global market to more than 50 percent by 2020 as advancing specifications and quality standards drive the demand growth for lubricants containing premium base oils much faster than the overall market. This growth is underpinned by technological leadership in producing premium base oils that permit formulation of products that meet increasingly stringent standards for improving fuel economy, lowering tail-pipe emissions and extending the time between oil changes. The key technology involved in Chevron’s base oil production is ISODEWAXING™, which the company first commercialized in 1993. 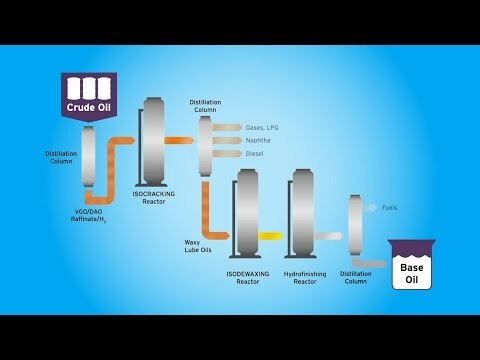 This technology enables the removal of essentially all undesirable sulfur and nitrogen molecules and transforms the waxy molecules into high-quality base oil. It also reduces the pour point, the lowest temperature at which a lubricant can flow. As a result, the ISODEWAXING catalytic process significantly increases the yield and quality of lubricant base oil over solvent dewaxing, the conventional method for base oil dewaxing at the time ISODEWAXING was invented. This technology effectively revolutionized base oil production, driving up the demand for Chevron’s premium Group II lubricants over the Group I lubricants produced through solvent dewaxing. ISODEWAXING is currently used in approximately 60 percent of all premium base oil production worldwide, reflecting the demand for premium grade oils that meet increasing regulatory standards for reduced emissions and higher fuel mileage. The benefits of Group II lubricants over those of Group I include increased engine protection, reduced high temperature deposits, less engine sludge, higher oxidation stability and greater piston cleanliness. In addition to the automotive market, premium base oils are in growing demand in the manufacturing industry, particularly in the Asia-Pacific region. In fact, about 90 percent of worldwide automotive and industrial demand can be formulated with Chevron Group II base oils. Chevron’s oils are a particularly good fit for hydraulic oils and are also effective when formulated with power generator turbine oils, since they have a much longer life than those formulated with Group I base oils. Thousands of people were involved in PBOP from conception to construction to current day operation. Here are a few of the people involved in creating this premier base oil facility. "The biggest challenge for me was to make sure that we did everything possible to integrate new contractors into Chevron's incident- and injury-free culture. At the start of each shift, I joined crews in the field for their toolbox safety meeting. I coined the phrase, "safety for breakfast," to describe all these timely safety engagements." "Seismic imaging is a tool that helps us understand what lies beneath the earth’s surface by bouncing sound waves off underground rock structures to build a picture of the subsurface rock formations and determine if they contain oil or gas. Seismologists use seismic trucks to generate sound waves and ultrasensitive devices called geophones to record how the sound waves echo within the earth. By studying the echoes, earth scientists try to determine the best location to place the well in the shale rock. Seismic imaging also helps well-site teams optimize drilling before it starts. Seismic data collection requires permits by regulators. It can take between six months and one year to study the data." "The standard of due diligence and rigor on the project was outstanding and reflected Chevron's commitment to Operational Excellence. During construction, I witnessed the inspection and acceptance of vessels, columns, piping and platforms; it was meticulous. That attention to detail was emulated in the safety culture. Everyone worked as one team." "My PBOP experience reinforced my understanding that Chevron has many dedicated employees who care about doing a good job and providing a quality project. It was great seeing everyone working together to work through issues. At the end of the day it was a successful startup and a fantastic way to end a project." "I have been with Chevron for 34 years, so to be involved in the opening of a new, world-class facility in the U.S. will not happen again in my career. It is a huge honor to be associated with the accomplishment."